Clear color. Bold, interesting, nutty aromas of cashew brittle, bread dough, nut and mineral oils, and pepper dust with a satiny, shy, dryish medium body and a warming, interesting, medium-length juniper jelly, dried flowers and stone fruits, piney herbs, and spice cream finish. A very elegant and restrained gin for sophisticated cocktails, particularly flips. Bottom Line: A very elegant and restrained gin for sophisticated cocktails, particularly flips. 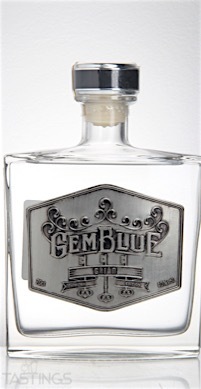 90 • Gemblue Gin 40% (Belgium) $43.00. Gin is the original flavored vodka, a clear spirit that is flavored with juniper berries and so-called botanicals (a varied assortment of herbs and spices). The spirit base of Gin is primarily grain (usually wheat or rye), which results in a light-bodied spirit. The chief flavoring agent in gin is the highly aromatic blue-green berry of the juniper, a low-slung evergreen bush (genus Juniperus) that is commercially grown in northern Italy, Croatia, the United States and Canada. Additional botanicals can include anise, angelica root, cinnamon, orange peel, coriander, and cassia bark. All gin makers have their own secret combination of botanicals, the number of which can range from as few as four to as many as 15 or more. 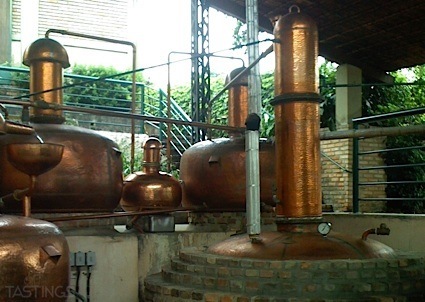 Most gin is initially distilled in efficient column stills. The resulting spirit is high-proof, light-bodied, and clean with a minimal amount of congeners (flavor compounds) and flavoring agents. Gin's lowland cousin, Genever, is distilled in less-efficient potstills, which results in a lower-proof, more flavorful spirit. Low-quality 'Compound Gins' are made by simply mixing the base spirit with juniper and botanical extracts. Mass-market gins, known as 'Distilled Gins', are produced by soaking juniper berries and botanicals in the base spirit and then redistilling the mixture. Many top-quality gins are flavored in a unique manner and are referred to as 'London Dry Gins'. After one or more distillations the base spirit is redistilled one last time. During this final distillation the alcohol vapor wafts through a chamber in which the dried juniper berries and botanicals are suspended. The vapor gently extracts aromatic and flavoring oils and compounds from the berries and spices as it travels through the chamber on its way to the condenser. The resulting flavored spirit has a noticeable degree of complexity. The most famous examples of gin are from the UK. These are among the most complex gins with subdued flavors of pine, peppery spices, citrus, herbal roots, and even floral notes, which are currently in vogue. Gin has experienced a revival thanks to the craft cocktail movement as the base for the wildly popular gin martini, a host of newly resuscitated classic cocktails, and adventuresome new libations. Gemblue Gin rating was calculated by tastings.com to be 90 points out of 100 on 3/11/2016. Please note that MSRP may have changed since the date of our review.